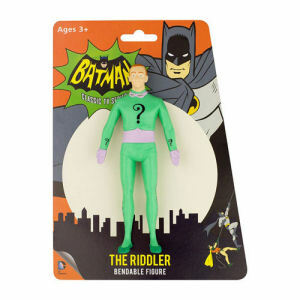 We have Just Sold out of Batman Classic TV Series The Riddler 5.5 Inch Bendable Figure. This Item is unavailable at present. From the Batman collection by NJ Croce. Batman Classic TV Series The Riddler 5.5 Inch Bendable Figure. Bend and pose your favorite DC Comics Batman heroes and villains. Measures 5.5 Inches Tall.